In the month of December 2017, we saw a slight decrease in the number of sales from November to December. 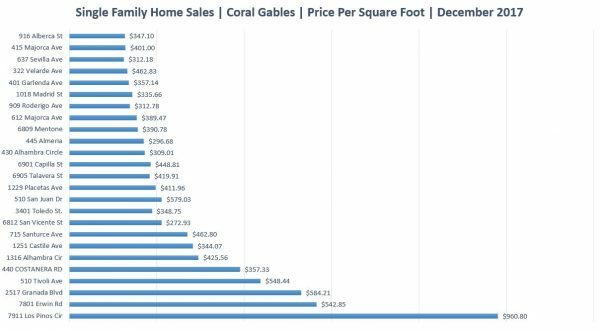 There was a total of 25 closed transactions in Coral Gables. There was 2 waterfront properties that sold this month. The price per square foot for this month water-front properties were $960.80 and $357.33. Last month average of water-front properties was lower. The sales price for the water-front properties this month was $4,900,000 and $1,950,000. The average price per square foot of non-waterfront homes was $404.52 which is slightly higher from last month’s average of $370.98. That’s due to a non-waterfront property selling for $2,825,000. Stay tuned to the blog to see how the trends in Coral Gables change over the month of January!